What Day Of The Week Was March 18? 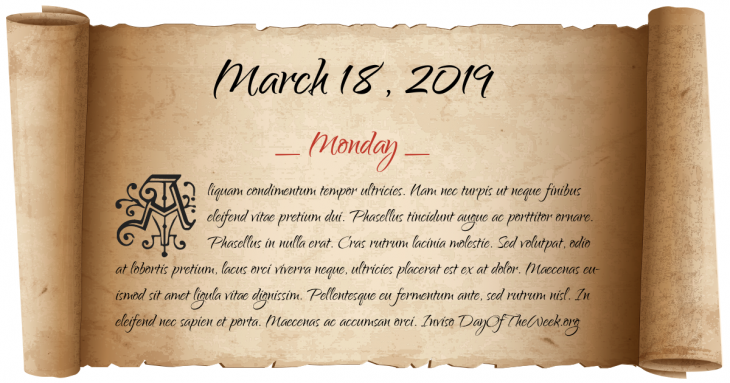 March 18, 2019 was the 77th day of the year 2019 in the Gregorian calendar. There were 288 days remaining until the end of the year. The day of the week was Monday. If the Gregorian calendar is not reformed, the March equinox will fall on this day for the first time in AD 4092. Frederick II, Holy Roman Emperor declares himself King of Jerusalem during the Sixth Crusade. The second Peace of Riga between Poland and Soviet Union. The eruption of Mount Vesuvius in Italy kills 26 and causes thousands to flee their homes. In Peru a landslide crashes into Lake Yanahuani, killing 200 at the mining camp of Chungar. In Egypt, a 4,400-year-old mummy is found nearby the Pyramid of Cheops. Who were born on March 18?